In my opinion, no software exists that is perfect for 100% of organizations. However, Allocadia is industry neutral and works for 2 marketers or 2000 marketers...it's very scalable in terms of functionality and infrastructure. The user interface is clean, well-thought out, and easy for marketers to use. It behaves like their spreadsheets in all the right ways...without the baggage of having budgets locked into separate spreadsheets. 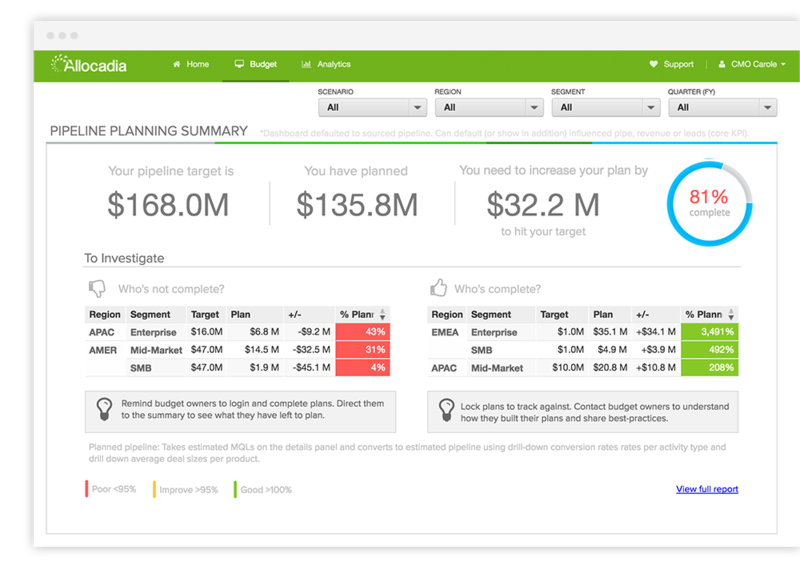 Allocadia knows that revenue attribution is important, and has great out-of-the-box adapters to flow actual spend and actual performance in to the tool. The reporting engine is both substance and style. Data is accurate, can be sliced-and-diced, and is easy for marketers to get what they want in an ad hoc fashion, if a canned report does not already exist. The visuals are also excellent, which promotes the use of analysis. An integrated calculator as well as an currency exchange calculator. It would make working with the stats a lot easier if some additional tools would be available. Improve the general performance. A topic which is valid at any time. No matter how good your performance is lately, there's always room for improvement. Before Allocadia I was using Excel to track my budget. This led to version control issues when sharing and more potential for incorrect functions to give inaccurate information about my budget. Adobe Analytics has helped us revitalize our business model by setting up our paywall monitoring through it. We're prevented from reaching important data on a smaller scale without customization. The great customer service has allowed our tools to instruct the nontech staff on how to utilize the data efficiently. From an organization perspective, having our view of exact budgets has reduced errors signfiicantly.